Nintendo’s been taking its own sweet time letting folks know about the Wii U. Weirdly detailed videos about what each and every button on the Wii U tablet controller does? Nintendo’s got you covered on that front. If you want to know how much the console will cost or even when you can buy one, well, tough. Release date, launch line up, just what controllers and games will come packed in the box: All unknown. Nintendo announced on Tuesday that it would host an event in New York City on September 13th. 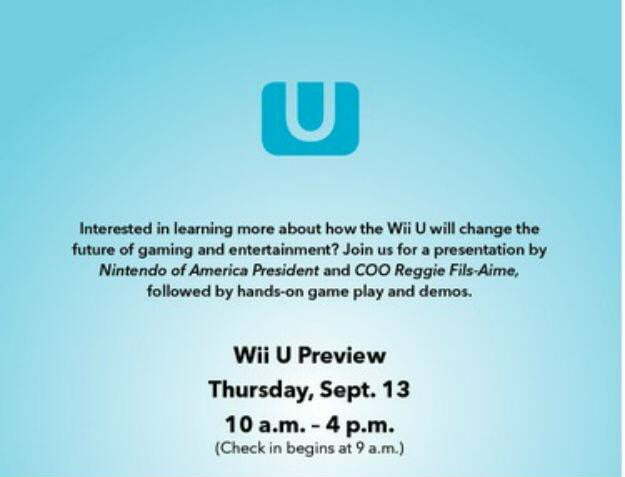 The invitation we received yesterday has a touch of the ol’ Nintendo Hubris in its wording: “Interested in learning more about how the Wii U will change the future of gaming and entertainment?” It promises presentations from Nintendo of America’s unusually popular president Reggis Fils-Aime and hours of play time for those in attendance. Tantalizing and vague, Nintendo’s favorite teaser tools. The company’s tricksy when it comes to press events. Remember the Nintendo 3DS conference in the middle of E3 2012? Nintendo promised it would reveal a bunch of unannounced games for its handheld and then proceeded to show footage exclusively of games it had already discussed in its main stage press conference. Wily is the word when it comes to Nintendo. Prognostication—and an ability to recognize patterns—is our specialty though. Here is what you can reasonably expect to appear and be discussed at Nintendo’s September event. * Release date, price, and bundle details. No duh. This will be the event when Nintendo finally stops procrastinating and announces when it will put its latest no-a-sure-thing to market. Wii U will likely hit Japan and the US in November, heading to the rest of the world shortly thereafter due to manufacturing hiccups. Expectations are that Wii U will cost $300, and odds are good that Nintendo will put the system out with a game packed in. The Wii’s astronomical success in the US owed much to the Wii Sports pack in, and Nintendo of America knows it. The mystery: Will Nintendo pack in a Wii U Controller Pro? A Wii remote for multiplayer? Unknown. * A flexible launch line up. Nintendo will commit itself to 2 or 3 first-party titles for Wii U’s release. These will likely be the divisive NintendoLand and the promising Super Mario Bros. Wii U. Third-party games, particularly ports like Assassin’s Creed 3 and Batman: Arkham City, will also get locked in for day one. Many, many games however will be relegated to the dreaded “launch window.” This means that, best case scenario, games like Pikmin 3 will be out before the end of the fiscal year in March. As the Wii, Nintendo 3DS, and pretty much every Nintendo system ever has proven though, games scheduled for the launch window—from The Legend of Zelda: Ocarina of Time all the way to Kid Icarus: Uprising—will come out whenever Nintendo feels like releasing them. What won’t be announced? Nintendo’s online strategy. There will be no news about a unified account system for the eShop or any specific details about Miiverse. Nintendo will claim the day is about the Wii U’s games and launch details.